At Tutor/Mentor Connection, Mike Trakan creates maps that look at the relationship among poverty, community resources, school performance, and locations of non-school tutoring/mentoring facilities for K-12 students. The maps help community, business, and political leadership visualize these relationships when working toward strategies and partnerships that offer much-needed support for these non-profit programs. The maps are also made available to journalists or anyone who wishes to include "tutoring and mentoring" in published discussions of social problems (crime, poverty, failing schools, etc.) and the search for comprehensive solutions. 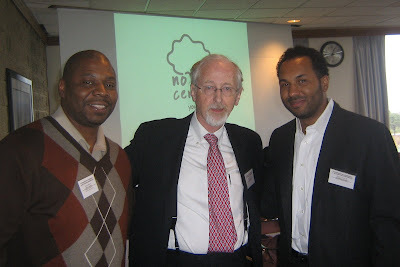 Recently, Mike has been blogging about how faith communities can support tutor/mentor programs. "I think you might conclude when looking at our maps that, while many people are already working to help bridge gaps in support structures needed for kids in impoverished neighborhoods to have a shot at meaningful careers and futures... there is a lot of work needed," says Mike. "Faith groups that are already hard at work and generous just might be perfect leaders for new multiple-congregation alliances that promote and support new and existing programs." 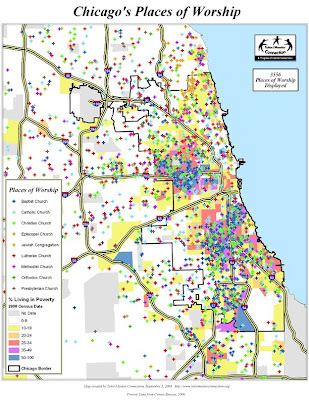 Recognizing the sheer number of churches in Chicago, and that most share common values of charity and service, Tutor/Mentor Connection believes that faith-based volunteers and donors can play a significant role in the establishment of more tutor/mentor programs and in supporting those which already exist. If you are interested in this topic, please head over to Mike's blog to find out more. Post a comment or send him an e-mail. I know he would love to hear from you. P.S. Mike is also a talented singer/songwriter. He put together a free song for this holiday season to thank his fans for support over the years. He describes it as "a spirited Christmas story straight from the streets of an economically-riddled North Pole." Give it listen here. On Monday, I posted an interview with Dan Bassill about leadership. He talks about the need for more leaders - in all sectors - to support tutor/mentor programs. He also talks about information-sharing and collaboration between programs. 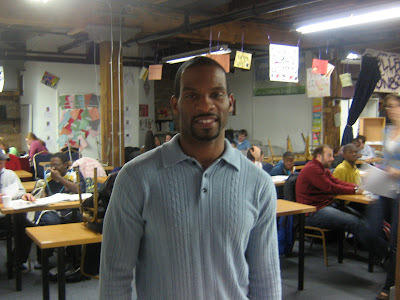 Dan, along with other founders, started the Tutor/Mentor Connection in 1993 to support the growth of tutor/mentor programs throughout the Chicago region. They have followed through with that mission over the years by maintaining a database of programs and by sharing ideas and concepts related to tutoring and mentoring. 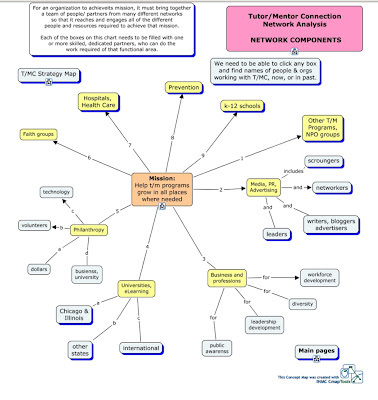 Tutor/Mentor Connection offers a plethora of resources, but how can we get more people involved? How can we get more program leaders to contribute their ideas and work together to improve their own programs, or help start new ones? Though we are all united by a desire to help youth rise out of poverty and into successful careers, we tend to work in silos. Each program raises funds, recruits volunteers, and runs day-to-day on its own. How can we come together for the better of us all? Two elements are needed to create a constellation: a need or opportunity, and energetic leadership by one or more partner. Like the stars in the sky, constellations are 'loosely coupled' together to create a rough and chaotic whole. Partners come together based on their own interests and assets, which usually ensures that the 'right' partners are at the table. This element of self-interest also makes it more likely that there are high levels of contribution and participation. More importantly, because of reduced competition, partners are able to raise considerably more money ... together than they would have individually. ... Also, funders readily appreciated the strategic benefits of working with all of the partners together. I think this is a great idea and I would love to see it adopted by tutor/mentor programs in Chicago. Imagine if we were all working as one - sharing ideas and resources - toward an overarching goal of keeping kids in school and preparing them for 21st century jobs and careers by the time they are adults. We could accomplish a lot. Would you join a team? Last week I sat down with Dan Bassill, President and CEO of Tutor/Mentor Connection, to discuss leadership, the most frequently tagged subject on his blog. I hope you enjoy listening to Dan's insights on the topic and much more. Helpful links can be found at the bottom. Part 1 [3:59] - What does a leadership strategy for a tutor/mentor program look like? Our goal is that instead of there being one leader saying 'follow me,' there be many leaders saying follow me and that each leader is working to empower other people to take on that same role. Tutor/Mentor Connection. What is it? If you have thoughts or questions of you're own, please post a comment or send me an e-mail. I would love to discuss and discover more about tutor/mentor program and nonprofit leadership. The 2009-2010 Youth Leadership Council held its third meeting on Friday, December 4th. Their first order of business was to determine guidelines for the Winter Clothes Drive. The project seems simple on the surface, but a lot of details had to be discussed. For example: is it best to sort by type (hats, gloves, coats, etc. ), size (small, medium, large, etc. ), or gender? After a heated debate, four categories were determined: 1) hats, gloves, scarves, and facemasks, 2) coats and jackets, 3) shirts and sweaters, and 4) jeans and pants. Other stipulations: donated items must be clean, in good condition, and neatly folded into a collection box. Also, when it comes to taking: "take what you need and be considerate of others," says Israel. 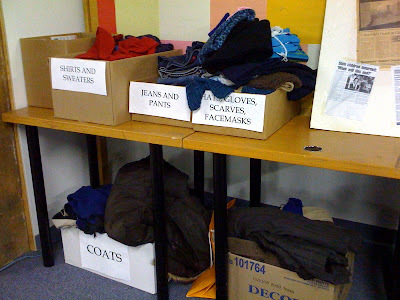 Two weeks later, we now have overflowing boxes of winter clothes in our center. Thanks, volunteers, for donating so many items! Our students truly appreciate your generosity. Stay tuned for more news from the Youth Leadership Council in 2010, when they will begin work on a fund raiser and a lounge. 7th grader Brittany Murphy, who just celebrated her 13th birthday on December 14th, lives in Lincoln Park and attends Oscar Mayer Magnet School. Her favorite subject is math because she likes to work with numbers and she anticipates counting a lot of money in the future. Her least favorite subject is reading, but she's starting to like it. When she doesn't understand a passage, she will look up words, re-read, or ask for help. She used to sit back and stay silent, but now she ask questions when she's confused. Brittany is on the cheerleading team and this year they made it to the city championships. They could have gone even further, but state was canceled, so, in actuality, they made it all the way to the top! At the competition, Brittany was very impressed by the dance team from Northside College Prep. After looking it up on the Internet, she is interested in attending high school there because they have good academics. After high school, Brittany has her sights set on International Academy of Design and Technology in Tampa, Florida, where her mom studied design and marketing. Brittany wants to be a fashion designer when she grows up. "Don't dress based on other people," she recommends. "Dress based on how you feel... You should be bright, but not too out there." Thanks for the advice! Eventually, Brittany wants to live and work in the fashion capitals of the world, New York and Paris, but, for now, she is happy in Chicago and expects to move back here after getting noticed around the world. She likes Chicago because you're never bored. There's always something to do. Brittany's other dream job is to be a teacher. She likes little kids. ("I'm addicted to them.") She has a few baby cousins who she loves to spend time with. "They are so energetic," she says. "They never keep you sitting around." Brittany enjoys dancing, watching TV, and playing games with her family. She's not shy at all; she's open minded; and she likes to meet new people. I think you'd make a great teacher, Brittany! At Cabrini Connections, Brittany is a member of Video & Filmmakers Club. She wants to record her own fashion show one day. 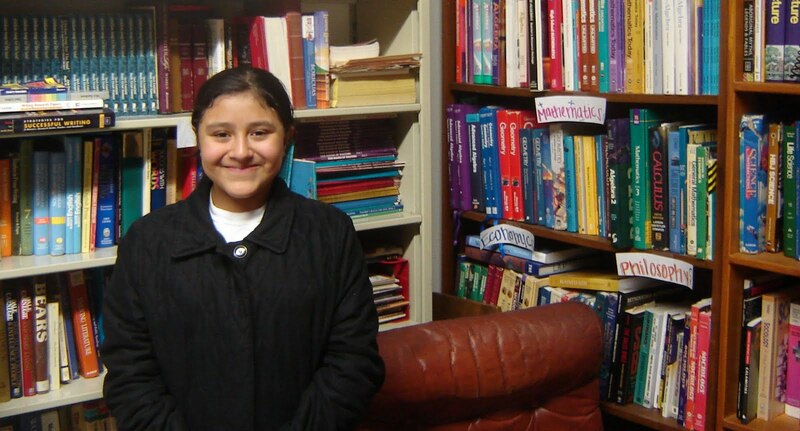 She attends tutoring sessions on Thursday nights with her mentor, Sonali Murthy. "I like her a lot," says Brittany. "It's easy to talk to her... Some mentors are strict and buckle down, but we can goof off and stay focused." Brittany and Sonali met a few times off-site this summer to get to know each other. Since then, they've opened up and are getting along well. We're happy to hear that! This holiday season, Brittany's extended family will spend the night with her on Christmas Eve. When they all wake up the next morning, they give gifts to each other. Sounds like a great time! As a New Year's resolution, Brittany simply plans to "do the best I can in all subjects." Good luck, Brittany! Congratulations on being in the spotlight! Sonali Murthy grew up in India before coming to the United States about 13 years ago. Her undergraduate degree is in economics and she received a Masters in Accounting and Information Systems from The University of Kansas in 1999. 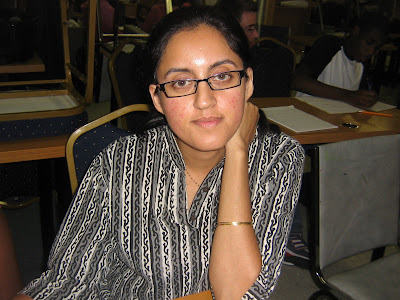 For most of the 2000s, Sonali worked as a consultant for Deloitte. Consultants are people who are sent out to companies around the country with problems in need of solving. Sonali helped telecomm clients with billing, customer service, and the implementation of IT systems. She would often be away from home for most of the week, flying out on a Monday and returning on a Thursday or Friday. After awhile, Sonali got bored with work, but there was still one day that she loved. Deloitte employees have one day a year dedicated to community service, and Sonali always chose to work in a school. She is very passionate about the cause of education... so much so that she wants to be a teacher! Last year, she transitioned out of her consulting job and she is now pursuing a Masters in Education at Northwestern University and volunteering at the Academy for Urban School Leadership in her spare time. Her goal is to become a middle school math teacher in an urban school. Sonali wants to give something back because she remembers how important her teenage years were. "In India, everyone has an 'it takes a village' mentality," she says. "You felt like you had to answer to everyone around you." She is also inspired by her grandfather who came to America on a ship and ended up going to Harvard. She realizes the importance of individual determination, but, also, the necessity of a support network. We at Cabrini Connections believe in the same necessities. We believe each youth has the ability to succeed, but 'it takes a village' to maximize his or her potential. 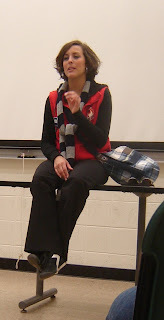 Sonali found out about us by Googling 'tutoring programs in the City of Chicago.' She started with her mentee, 7th grader Brittany Murphy, in August and is "absolutely loving it." She compliments our program on having great infrastructure, enthusiasm, organization, and commitment, and she says that she is very encouraged every time she comes to tutor. She and Brittany started off by talking about high school selection. Brittany identified the schools she wants to go to, all of which are challenging, and they are now focused on what needs to be done to get into them. Away from tutoring and studying, Sonali is learning to play guitar. She will also be taking voice lessons soon. She loves jazz and the harmonica, and she also loves animals. She had a dog while in India that's 17 years old! For the holidays, Sonali is going to Florida for three weeks with her husband. Safe travels, Sonali. We look forward to your continued presence in 2010. Thanks for setting a great example! 7th grader Marquise Cook goes to Andersen Academy in Wicker Park. His favorite subject is science because it's hands-on, which makes it fun. He recently participated in an experiment with needles where he had to poke his own hand to explore sense of touch. Now that's how you get students to pay attention! His least favorite subject is math, which has become a priority for him and his mentor, James West, during Wednesday night tutoring sessions. Furthermore, Marquise is on two sports teams at Andersen; he plays middle linebacker for the football team and power forward for the basketball team. 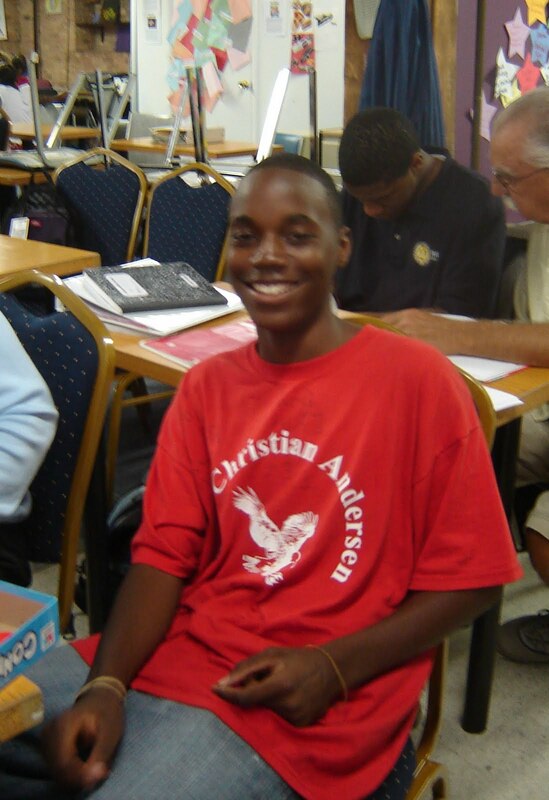 In a couple years, it will be time for Marquise to enter high school. He has been on the A-B honor roll since Kindergarten so he should be on track to get into a good school. He would like to go to Whitney Young, Lane Tech, Walter Payton, or Schurz High School. Marquise says he cares about school because "it gets you a good life." Once he gets through school he says he wants to reach out to other kids like him that need an education. It takes leaders like Marquise to uplift a community and with that mind state he's well on his way to being a great one. For college, Marquise would like to study engineering at Tuskegee University, a school some of his family members have attended. 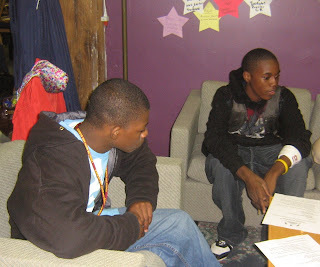 Marquise already knows a lot about college with the help of our College Zone. He has been on every college trip this fall. "I like them because you see what college life is like before you get there," he says. "You might not think you want to go somewhere, but you can find out about it." I'm glad you have enjoyed the visits, Marquise. Maybe you'll be the one showing us around some day! In addition to coming on field trips, Marquise is a member of Video and Filmmakers Club, which meets on Monday night, and Tech Club, which meets on Tuesday night. He joined Video Club to make a movie, be in the movie, and present it to people. His favorite types of movies are horror, comedy, and, sometimes, "meaningful" films. 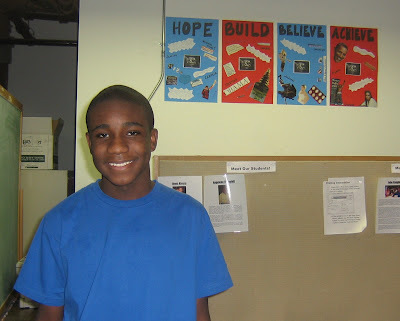 In Tech Club, Marquise has worked on a Cabrini Connections video game and logos for our 2009 Holiday Fund. In fact, his work (below) is featured on the outside of the mailing envelope! He says he likes technology because it's come so far. "A little thing can become so big," he says. "In 50 years, everything will be automatic." Well, let's hope we can at least keep creativity like yours, Marquise. Great job! Marquise has lived in Cabrini Green his whole life. He likes Chicago because the seasons change; you get a little bit of everything. He dreams of living in a big condominium in downtown Chicago and traveling to a tropical place to get a break. He also dreams of owning his own business because he wants to be his own boss. The holiday season kicked off well for Marquise with two Thanksgiving meals. His favorite part was mac 'n' cheese with dressing and cranberry sauce. Now he's looking forward to Christmas and New Year's Day. His resolutions for 2010 are: ignore ignorance, do well in math, and "stay on the top." Good luck, Marquise! I know you'll have a great year. First year mentor James West graduated from Northwestern University in 2008 with a degree in computer science. He chose NU because of its great engineering school and its proximity to Chicago. He thought it would be a different, interesting experience. Before moving to the area, James lived in Dothan, Alabama. Both of his parents were doctors and his older sister, who went to Auburn University, is a nurse. James says the best part about Alabama is the warmer weather. He loves the outdoors, but he'll take fishing and water sports over ice skating and skiing any day. James works as a software engineer for Trading Technologies. He develops internal software for the company which, as a whole, develops software for trading futures (part of financial markets). He would like to go to graduate school at some point and possibly move to a smaller city in a warmer climate. He loves school because you are constantly with people. In college, as a member of the fraternity Pi Kappa Alpha, he lived with several close friends in one big house. James also dreams of working in another country for a year. After graduating high school, he went backpacking in Europe for five weeks with a friend and absolutely loved it. He studied abroad in Rome, Italy, for a summer during college, too. Like so many other people, James found out about Cabrini Connections through the Internet. He was looking for an opportunity to volunteer and ours looked good because he has always done well in school, thus making him a good tutor, and our location is convenient. James lives just a few blocks from our center. He is proud to be working with kids from his neighborhood. But, though it was a good fit on paper, James knew this opportunity would be challenging. He had never worked with children before. Luckily, he was paired up with a fantastic young man, 7th grader Marquise Cook. "We've developed a pretty good relationship," says James. "We've become closer... Before, he would give me the shortest possible answer to my questions, but now he'll go into it." All relationships take time, but because James and Marquise have had almost perfect attendance, they've been able to make good progress. Marquise usually brings homework, but even when he doesn't have any, he and James manage to make good use of their time together. James will make up math problems or ask questions about grammar. Both in this case and when they're doing regular homework, James has been able to assess what levels Marquise is at in different subjects. Therefore, when they do have extra time, he is able to focus on those areas. "We rarely play games," says James. "Just schoolwork. Start that way and it's what they expect." That's all great advice, James! You're new to tutoring, but I already think you could lead a training workshop. Keep up the good work. We appreciate it! Brian Wallace is originally from Charlotte, North Carolina. He has an undergraduate degree in business administration from The University of North Carolina at Chapel Hill and a master's degree in business administration (MBA) from The University of North Carolina at Charlotte. He is a very proud Tar Heel. Their men's basketball team has won five NCAA tournament championships including 2009. Brian presently works as a Senior Manager for Allstate Insurance Company. He has worked with them for 13 years, but he just moved to an office in Northbrook, IL, in July 2008. His job has a lot to do with finance, measurement, and analytics. He essentially analyzes how effective and profitable their business is. Right now he is in a Leadership Rotational Program which rotates him through three different work areas. Within the next five years, he hopes to move up to the director level of management in the area of direct sales and service. What keeps Brian committed to his job after so many years is the relationships. "I have people I've worked with that I'm still in contact with 10 years later," says Brian, "and some I met two or three years ago who I work with a lot now." He has the opportunity to move around within the company and work with a lot of different people which is a gratifying experience often absent in big companies. Outside of work, Brian likes to travel, read, and work out. His favorite U.S. cities are Miami and New York; he's a big fan of John Grisham; and he ran the Chicago Marathon this year (all 26.2 miles!). Since coming to Chicago, his favorite thing to do is explore and discover new restaurants. He recommends Carnivale on Fulton Market and Sticky Rice on North Western. Brian found out about Cabrini Connections through his job's volunteer site. He works with 7th grader and Youth Leadership Council Member Israel Dosie. "It has been a very rewarding experience," says Brian. "I look forward to it every week." He says he and Israel get along very well because they have mutual respect for each other. To get to know your student, he suggests being open and approachable. "Share information about yourself," he says. "Make them feel at ease." A lot of tutors have found openness to be beneficial to relationship-building. We're glad it's working for you! For the holidays, Brian plans to spend Christmas with his family. He has a younger brother and a younger sister and his parents still live in Charlotte. For New Year's Eve, he will be in New York for a function with his fraternity, Kappa Alpha Psi. Have fun, Brian! You deserve it. Thanks for being a great mentor. Israel Dosie is a 7th grader at Andersen Academy. He has been on the A-B Honor Roll since Pre-K and his favorite subjects are social science and social studies. He recently learned the science behind headaches - how they occur and how to prevent them - so if you need advice on how to get rid of a headache, talk to Israel. He also plays shooting guard for the school's basketball team, so he can teach you a thing or two about jump shots as well. He has been a starter for three years and Andersen has won three citywide championships. For high school, Israel wants to go to Whitney Young, Lane Tech, or Lincoln Park, and for college, he wants to go to University of North Carolina (UNC). "I told my tutor that," says Israel, "and he said, 'What? I went to UNC.'" That's right. Israel's mentor, Brian Wallace, graduated from UNC. He knows exactly what it takes to get there and succeed, and Israel is starting to figure it out, too. He has been on all of our college trips this year; to Northwestern, DePaul, and UIC. He knows what college is like and he knows what kind of grades and test scores he will need to get into the college of his choice. Brian and Israel have been a great match since starting in September. Israel says they talked a lot when they first met which helped them get to know each other. Israel brings his homework to each tutoring session and if he doesn't have any, Brian will make up problems or test him on words. For example, he'll have him spell out words and give their definitions. Great idea, Brian! Israel wants to be an architect when he grows up because he loves to draw and measure. ("Give me a picture and I can draw it.") This is one of the reasons why he joined Art Club on Monday nights. He made a bracelet this week and his previous project was a brick wall with a fist made of wires going through it. 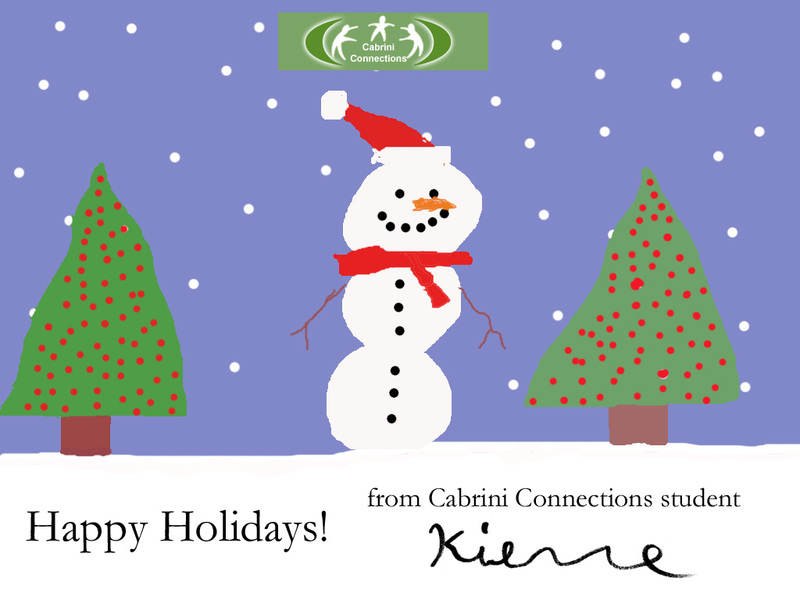 He is also in Tech Club on Tuesday nights, in which he has been working on Cabrini Connections holiday logos (below). Lastly, Israel is the youngest and only first-year student member of the Youth Leadership Council. He joined so that he could help out around the center and plan fun activities. Right now he is in charge of publicity for our winter clothes drive, so look out for an announcement from him soon. Israel has six brothers and five sisters. He got to see a lot of his family last week for Thanksgiving. He had two Thanksgiving meals, each at a different house. (He's still feeling the effects.) His favorite dish is ham and dressing with stuffing. His favorite meal overall is pork chops and chicken. For the rest of the holidays, he has no big plans but to relax once school is out. For Christmas, he hopes to get some new clothes and an iPod. To explain how he's maintained such good grades over the years, Israel says he always thinks, "What would my oldest brother do?" His oldest brother, who lives in Minnesota and attends community college, is a major role model in his life. Israel also studies a lot. "I keep reading until I get it," he says. "I write more and more notes so then it's easy on the test." You sound like you're in college already, Israel! Thanks for your continued participation in everything at Cabrini Connections. We look forward to seeing you around for a long time to come. Thank you for reading my blog! I've had more than 500 unique visitors since I started in July which is both remarkable and humbling. I care so much about the youth in our program and I do my best to transfer that feeling through my writing. I appreciate every click of the mouse and so do our kids (like Kierre Halbert who created this image in our Tech Club). Far too often, no one is listening, but I can say with confidence that a lot are. Our holiday theme is 'Tis the Season and CC/TMC is the Reason. Please spread the word. 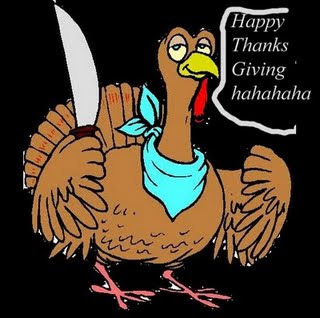 Thank you again, and have a blessed holiday! Each year Cabrini Connections holds a winter clothes drive so that students who may otherwise find it difficult to get to our program can receive some thermal assistance. Savon Clark and Israel Dosie will take the lead on this project. Savon is in charge of logistics (bins, rules, sign-in/out sheets) while Israel is in charge of publicity (flyers, announcements, etc.). Inspired by Melissa Young's Halloween Bake Sale, De'Sean Hale (pictured above during announcements) and Ashaunti Roby are going to arrange a fund raiser for Cabrini Connections. 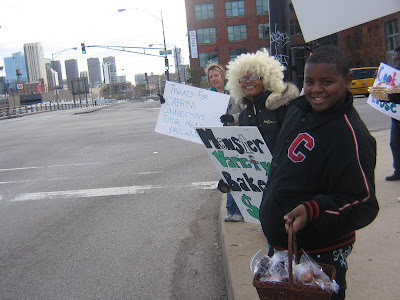 De'Sean would like students to sell candy over the holidays. 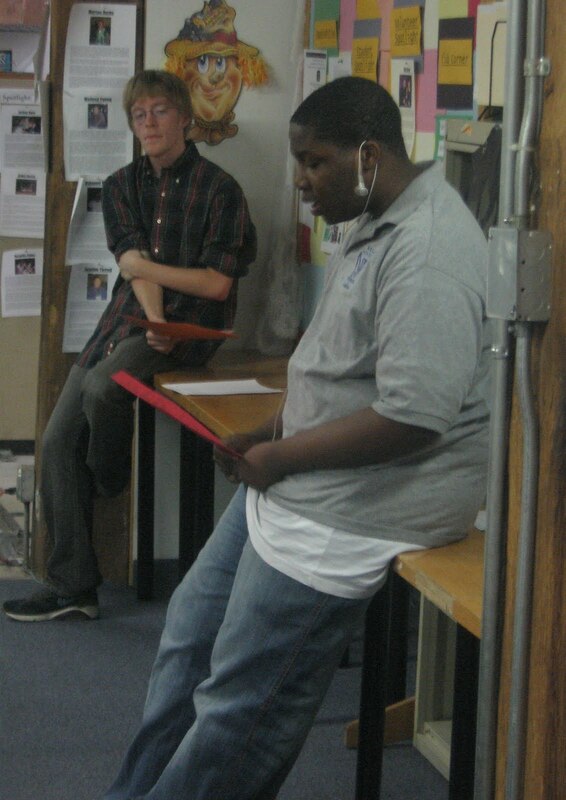 He and Ashaunti are going to research ideas and present them at the next meeting. Sean Mayfield and Victoria Rivera will take the lead on arranging a lounge somewhere in our center. Sean will design the layout and Victoria will figure out what furniture is needed. At the next tutoring session, they will ask around for student input. Please be on the lookout for further news regarding these projects. Savon, Israel, De'Sean, Ashaunti, Sean, and Victoria are going above and beyond, and we want to support their endeavors as best we can. By donating clothes, money, or furniture, you will not just be reinforcing the work of these six council members; you support 76 students, 88 volunteers, and six staff who use our facilities on a weekly basis. We greatly appreciate your generosity. Thank you. Last week's Tutor/Mentor Leadership and Networking Conference was a tremendous success. More than 30 presentations connected 155 people who want to help inner city youth have brighter futures. You can see the list of speakers and attendees on the conference web site. Because we keep this list published, the networking started at the conference can continue indefinitely. 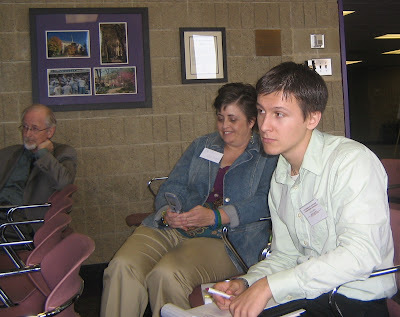 Here's an example of how the conference (net)worked for me. At 9am on Day One, I met Heidi Massey while I was out in the cold selling parking tickets. 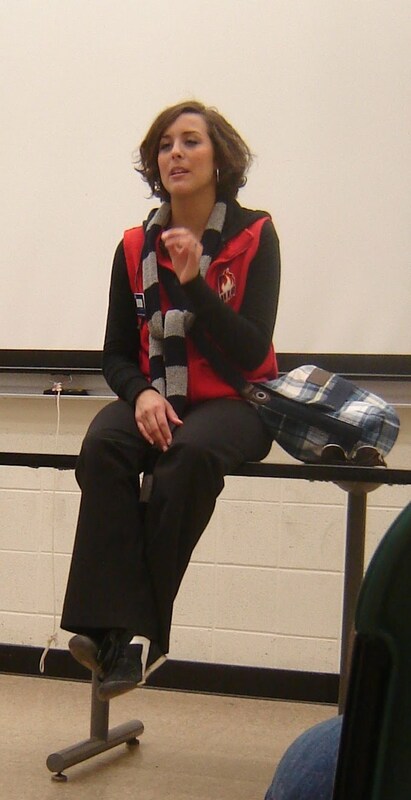 She was sympathetic, encouraging, and just plain friendly. Four hours later, we met at lunch and learned about each other's work. Heidi wants to start a nonprofit organization that networks other NPOs together. 12 hours after our first encounter, Heidi and I were following each other on Twitter. 30 hours after, at the close of the conference, she left me with a personal compliment that made my day. 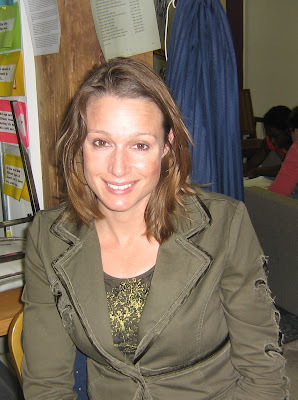 As a recent graduate, still with a lot to learn about nonprofits, I consider Heidi an asset as I move forth. I look forward to keeping in touch with her. To extend the example... Heidi (center) introduced me to Oliver Miller (right), Community Engaged Scholarship Coordinator and AmeriCorps VISTA at The Chicago School of Professional Psychology. In Winter 2009, I interned at the organization that placed him, Illinois Campus Compact, so it turns out we know some of the same people. Oliver is looking to start an e-mentoring program at The Chicago School, so I pointed him to David Neils, Director of the International Telementor Program, whom I had met the previous day. It turns out Oliver had already spoken extensively with David and gleaned a lot of advice from him. Like Jean Russell said in her keynote speech on Friday, you can accomplish a lot once you have the right people in the room! Well, with the Internet, we can always have the right people in the room! ... or at least on the same web sites. Please check out the Tutor/Mentor blog (which has links to all of our blogs) and comment. You can also become a fan of Tutor/Mentor Connection on Facebook and join the Tutor/Mentor Ning Network. 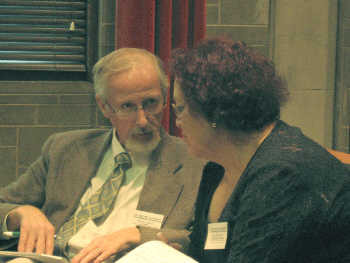 Let's continue to collaborate and share ideas just like we did last Thursday and Friday, and let's begin to think about how we will plan, promote, and fund the May 2010 Conference. Thank you! Alexandra Barcenas is a 7th grader at Newberry Academy. She has always lived in Chicago and likes it a lot. The most recent fun she had in the city was seeing Jersey Boys at The Bank of America Theatre downtown. Alex lives in Logan Square with one sister and two brothers, but she has a lot of extended family in the area. For Thanksgiving they are gathering at her aunt's house and for Christmas they will be at her godfather's house. She is definitely looking forward to the holidays. In school, Alex's favorite subject is math because "it's easy." Her most challenging subject is social studies because it's hard to understand. She plans to get better by listening in class and doing her homework. She also has the help of her mentor, Liz Jandrain. Liz and Alex are both new to Cabrini Connections this year, but you'd think they've known each other for years. Alex is shy by nature, but Liz made jokes when they first met to get through to her. Now Liz helps Alex with her homework and their goal is to get an A in social studies. Good luck! In a few years, it will be time for Alex to go to high school. She would like to attend Homewood-Flossmoor Community High School in the south suburbs. After that it's on to college. She would like to attend DePauw University in Greencastle, Indiana, which is where one of her cousins went. She wants to study Spanish because Mexican culture is very important to her. Alex's ultimate goal is to be a singer when she grows up. She dreams of becoming a star and meeting Zac Efron of the High School Musical film series. (I'm sure he would love to meet you!) She is also a fan of the Twilight series, part two of which came out last weekend (New Moon). In her spare time, Alex likes to play sports, read and volunteer. She plays shortstop in baseball, she recommends The Spiderwick Chronicles, and she volunteers at the library. We are very thankful to have Alex in the program and we wish her all the best! Liz Jandrain graduated from Loyola University Chicago in May 2008 with a Bachelor's Degree in Human Resources (HR). Since then, she has been working as an HR Assistant at Quarasan, a full service conceptual developer of content for publishers of educational materials and products. They work with their clients to create products that help kids learn and teachers teach. Liz's job is to help with anything that needs to get done. She helps the Vice President and Director of HR; she recruits and hires new talent; she handles orientations and paperwork; she runs the holiday committee and wellness program - the list goes on. "I love to work with people," says Liz. "I help people do what they do better." In HR, you help the employees, which means Liz helps new, current, and former employees with their needs. She credits getting her job to the internship she had at Quarasan while still in school. "It's important to build your resume up," she says. "Any activity that will set you apart from anybody else is good." Liz is happy with her current job, but she does dream of having her own boutique hotel or candy store in the future. She also wants to start a family. Right now she has no family in Chicago, but she does have a boyfriend and a cat to keep her company. She is going home, though, to spend Thanksgiving with her family. Liz grew up in Milwaukee, Wisconsin, but she moved to Columbus, Ohio, when she was seven, which is where her parents still live. Her sister is a teacher in Phoenix, Arizona, she has a brother in the Navy in Washington, D.C., and she has another brother who goes to school in Dayton, Ohio. Liz is looking forward to Thanksgiving because she loves to eat. She is the self-proclaimed "Queen of Thanksgiving." Her favorite dishes are sweet potatoes and cranberry relish. Liz heard about Cabrini Connections from fellow volunteer MC Nelson, who is also an employee at Quarasan. MC set up Cabrini Connections as the beneficiary to a gift basket raffle at their company last year. 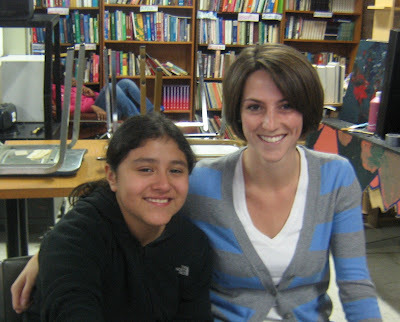 Liz works with 7th grader Alexandra Barcenas on Wednesday nights and loves coming to tutor her. "I think I get as much from going as [Alex] does," she says. "To hear the students' hopes and dreams and positivity... to have that, personally, is great." In addition to social studies, Liz has been helping Alex with her shyness. Her tips for mentors faced with shyness are to keep asking questions and, if you get no answer, talk about yourself. Also, "try and be funny," she says. "Get some emotion out of them. Kids are silly." Great advice, Liz! We're happy to see that you and Alex are getting along well. Thanks for setting a great example! In her morning keynote speech, Jill Zimmerman, VP of The Alford Group, will address "The State of Funding for Tutoring and Mentoring Programs and Non-Profits." Alex Cornwell, Associate Director of Chicago Lights Tutoring and Summer Day Program, will lead a workshop on creating and managing a successful job training and career development program for high school students. Ethan Austin and Desiree Vargas of GiveForward will lead "Online Fundraising 101 for Small Non-Profits. We have had great success with their platform! In the afternoon keynote, Tim Hogan, Creative Director at The Royal Order of Experience Design, will discuss how business and non-profits can work together by providing volunteers and their skills. Deborah McNelis of Brain Insights will provide an overview of brain development in her workshop through visual demonstrations which demostrate how you can have more impact on the learning brain. You could attend all of these workshops in succession tomorrow, but there are plenty more to choose from (at least four in each of four workshop time slots). See the agenda for a complete breakdown with descriptions. For more details on the conference and to register, visit http://www.tutormentorconference.org/. Thank you. Former Cabrini Green Tutoring Program student Isaiah Brooms, now the Director of Admissions at Westwood College - Virginia Ballston Campus, will give the opening keynote. Bill Curry, COO of Breakthrough Urban Ministries, who I met this summer, will lead a workshop about his organization's innovative approach to growing mentoring relationships among a community of students and a community of volunteers. EL Da' Sheon Nix, former Northwestern University football player and current Administrative Coordinator at Cabrini Connections, will discuss how to engage athletes, business leaders and celebrities as advocates for volunteer-based tutor/mentor programs. Valdis Krebs and Jean Russell will explore, explain, and empower thrivable communities in the afternoon keynote address, "Understanding Social Networks." Sandra Garest, Senior Dream Manager at Floyd Consulting, will help participants find and pursue their passions in her afternoon workshop, "Inspiring others to Dream Big." For more details on the conference and to register, visit http://www.tutormentorconference.org/ or call 312-492-9614. Thank you. 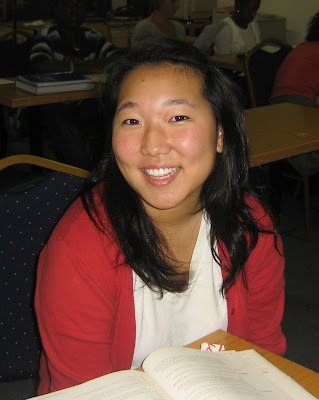 Sandra Lee is a sophomore English major at University of Illinois at Chicago (UIC), the same college her mom went to and the same college we visited last weekend. 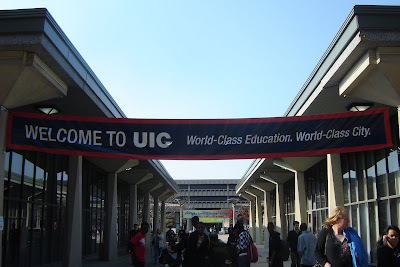 She grew up in Northbook, IL, a northern suburb of Chicago, and chose to attend UIC because it's close to home, she has friends there, and being close to an urban area offers a lot of opportunities. Sandra has found herself learning more in college than she did in high school. "The best thing about college is that you can pick your classes," she says. "You can learn what you want to learn." Sandra's goal is to become a high school English teacher. She wants to go straight into teaching after college. 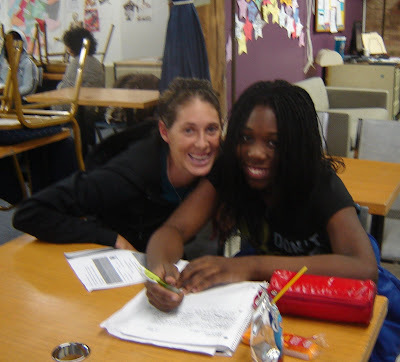 Sandra is in her first year as a mentor at Cabrini Connections. She works with Northtown Academy Senior Alexis Montgomery, a five year veteran in the program, and they've hit it off extremely well. Sandra has tutored really young kids before, but she wanted to get hands-on experience at a place like Cabrini Connections to confirm that teaching in high school is what she wants to do. "To work with someone in high school inspired me to stick with education," says Sandra. "I love Alexis. I feel lucky to have her." In her spare time, Sandra loves to shop, read, and spend time with family and friends. She has a large extended family and is looking forward to big family parties over the holidays. Her favorite time of year is Christmas time in Chicago with the big Christmas tree in Daley Plaza and ice skating in Millennium Park. Though she may go to New York to teach for a few years, ultimately Sandra wants to stay around Chicago and start a family in the suburbs. At present, Sandra is assisting Alexis with her college search and applications for admission. "[Alexis] has so much to offer," says Sandra. "She's such a bright girl... She can make a whole room smile." With that kind of support, I know Alexis is bound for great things. Thanks, Sandra, for being such a great mentor right off the bat. Kierre Halbert is a 7th grader at James B. McPherson School. His favorite subjects are math and social studies because he gets good grades in those classes. 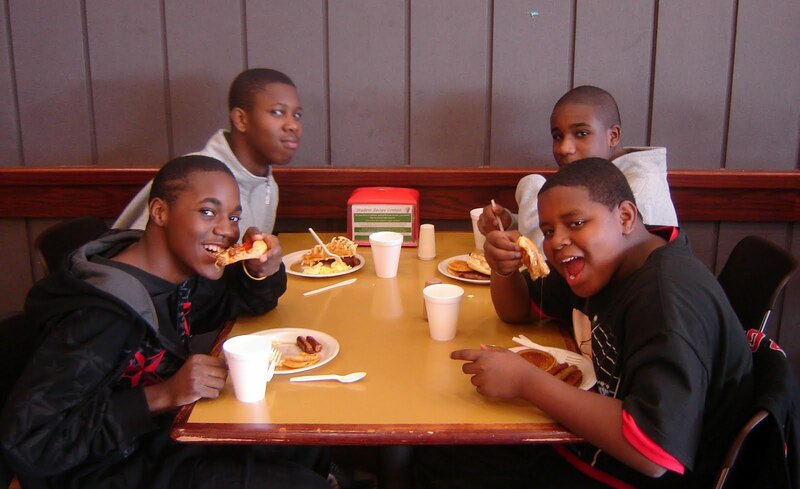 After graduating from elementary school in 2011, Kierre would like to attend Walter Payton College Prep, Amundsen High School, or Von Steuben Metropolitan Science Center. Kierre is a native Chicagoan who currently resides in Cabrini Green. He loves Chicago (one of his favorite events is Bike the Drive), but if he were to live anywhere else, it would be Atlanta, New York, or Toronto, Canada. He has already visited Florida, Washington, D.C., and Las Vegas, and if he could go anywhere in the world it would be Tokyo, Japan. I think Kierre is going to collect a lot of frequent flyer miles in his future! This is Kierre's first year at Cabrini Connections and, like his cousin, NyShanell Freeman, he has already established himself as a model student. He does an exit and entry page in SVHATS every time he comes to our center which has earned him a Top 5 spot on our leader board. 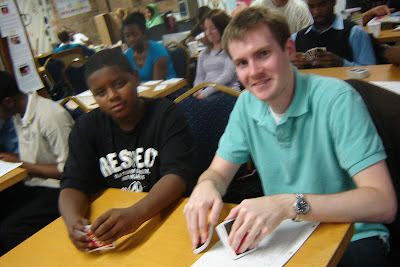 He attends tutoring on Thursday night with his mentor Alex James who is also in his first year. They primarily work on math, spelling, and science. Kierre says, "he's great!" When Kierre grows up he would like to be an engineer, a photographer, or a movie director. In college he would like to study technology and science as an engineer, hopefully at Columbia College or Clark Atlanta University. Kierre has been on all three college visits this quarter, so he's starting to get a good sense of what college is like. For now he's just enjoying life as a 13-year-old. #1 on his wish list for the holidays is an Xbox 360. Maybe if Santa reads this spotlight, he'll grant your wish! Thanks, Kierre, for taking advantage of everything we have to offer! On Saturday, November 14th, I accompanied nine Cabrini Connections students to University of Illinois at Chicago (UIC) for a college visit. At the start of this quarter, our objective was to offer one college visit per month and so far we've followed through with that goal. 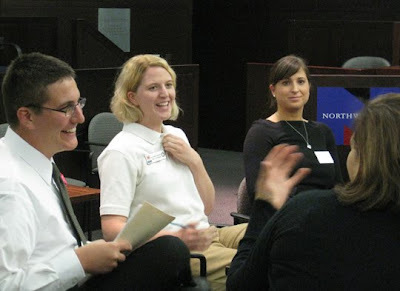 In September we visited Northwestern University and in October we visited DePaul University. All of these trips are part of our College Application Assistance Program (a.k.a. the College Zone) which provides learning opportunities and support related to college admissions. Once again, our trip began in a dining hall. Thanks to UIC Dining Services and Sodexo, we were treated to "All-You-Care-To-Eat" breakfast in the East Cafe of UIC Student Center East, and we all left satisfied. (There was even a competition to see who could make the best Belgian waffle. Kierre won.) Special thanks to Roslyn Pitts, Director of UIC Meetings, Conferences, and Dining Services, for helping arrange our visit. We like to instill positive associations with college and buffet-style dining halls are a great way to do so! After lunch we went to an information session. We ran late because of some confusion regarding its location, but we made it in time for a Q&A session with current students which was informative. Soon it was time for our campus tour led by the wonderful Ana. Our group was comprised almost entirely of high school students (one parent) which relaxed her and allowed for a more casual tour. She prompted our students with questions throughout the tour and they always replied promptly. "What do you want to study?" got answers like architecture, English, chemistry, and computer engineering. For each answer, she was able to connect it to an actual area of study at UIC. It was a great way to show that in college you can study whatever you want! Ana led us through most of East Campus, including The Quad, a classroom in Douglas Hall, and the Student Recreation Facility. We ended in Student Residence & Commons South where we got to tour three different types of dorm rooms with actual students living in them. UIC is one of the most diverse schools in the country. There is not a single racial/ethnic group which represents a majority. It's nice for our students to see people that look like them at a university. Ana herself, a first-generation college student, was a good model for what it takes and what it's like to attend college. Now, usually, our visit would end here, but UIC invited us to a Flames basketball game! Volunteers, students, and their friends met at Cabrini Connections to board a bus for a free ride to the game. At UIC Pavilion, those of us who went on the college visit met them to witness the UIC Flames defeat the University of Illinois at Springfield (UIS) Prairie Stars 72-59. UIC held a commanding lead throughout in their first game of the 2009-2010 season. Thank you to Megan Sparks of UIC Community Assist Program for providing this exciting experience. A lot of our youth currently play sports at school, so I'm sure it is was a pleasure for them to witness competition at the next level. Your donations to Cabrini Connections make visits like this possible. Please consider making a small donation on our web site. Thank you! It connects leaders and supporters of volunteer-based tutoring, mentoring and education-to-career programs with each other. It builds visibility so that more volunteers and donors will choose to support tutor/mentor programs in the Chicago region. 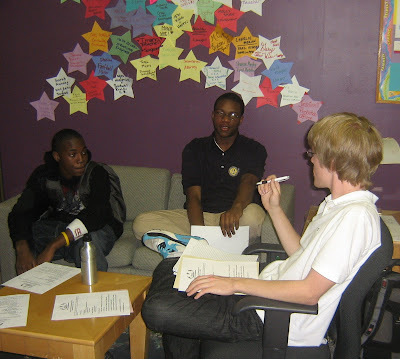 It helps Tutor/Mentor Connection maintain its Chicago Area Programs List of area tutor/mentor programs. We hope you'll join us for two days of information-sharing and learning. Please review the agenda, workshop descriptions, and speaker bios to find out more about what you'll be experiencing. For more details on the conference and to register, visit http://www.tutormentorconference.org/ or call 312-492-9614. Thank you. Collect knowledge from key stakeholders about volunteer-based tutor/mentor programs: how programs succeed, where programs are located, and where more programs and resources are needed. Aggressively share this knowledge through marketing and public awareness campaigns, capitalizing on the Internet as a chief vehicle of communication. Strengthen involvement of community and industry leaders to increase essential resources to tutor/mentor programs. Facilitate understanding and collaboration among stakeholders to develop the long-term, integrated actions needed to help youths move from birth in poverty to a job or career by age 25. We will do all of these things at next week's conference. You can view a concept map of this strategy here. For more details on the conference and to register, visit http://www.tutormentorconference.org/ or call 312-492-9614. Thank you. With five days left until the conference, I would like to share with you this five minute video. 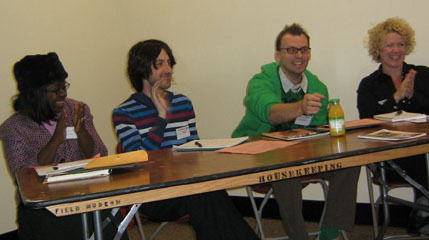 In 2007, we asked four members of the Tutor/Mentor Connection why they do what they do. Fast forward to the last minute and a half for great testimonials about the conference! "It might just be a conversation that you have with someone," says Mark Duhon, Executive Director of HighSight, "or it might be a workshop that you go to that gets you thinking about something that can make a difference." For more details on the 2009 November Tutor/Mentor Leadership and Networking Conference, and to register, visit http://www.tutormentorconference.org/ or call 312-492-9614. Thank you. With six days to go, I would like to play six degrees of separation (the theory that everyone is at most six steps away from any other person on Earth). I'm going to get from myself to President Barack Obama, but it's only going to take two steps! 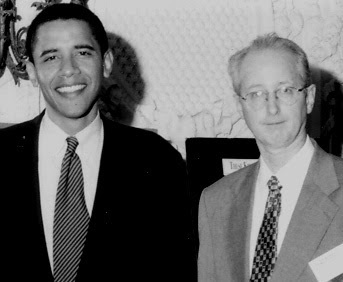 I work with Dan Bassill, President of Tutor/Mentor Connection, and he met Obama at the May 1999 Tutor/Mentor Leadership & Networking Conference. As Senator of Illinois at the time, Obama attended the conference and presented the Thomas A. Demetrio Lend-A-Hand Award to Horizons for Youth. So think about it... at next week's conference you could meet a future president! OK, that may be a stretch, but it does highlight the fact that this is a conference for leadership and networking. You will meet leaders in the nonprofit world who may better your organization now and lead to further support and opportunities in the future. 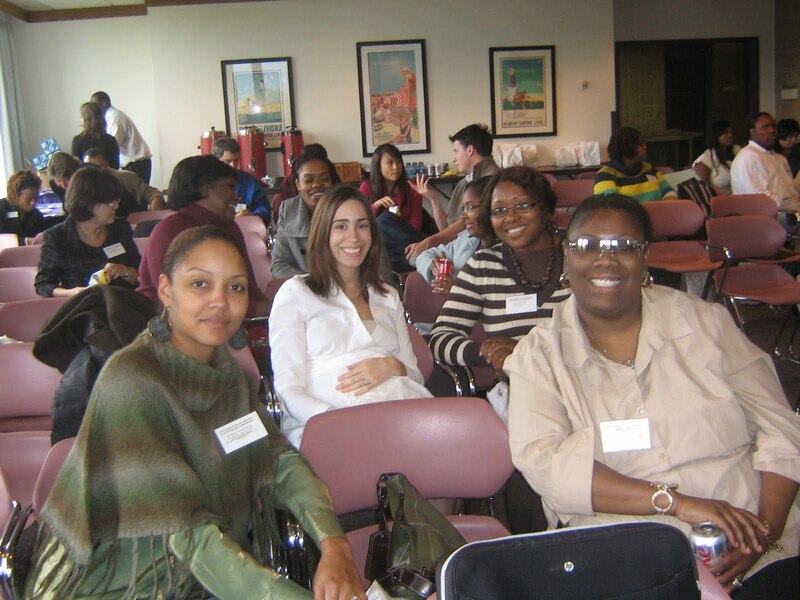 For more details on the conference and to register, visit http://www.tutormentorconference.org/ or call 312-492-9614. Thank you. The 15th Annual November Tutor/Mentor Leadership and Networking Conference starts a week from today and in anticipation I will be counting down the days by reference to resources and interesting information related to the conference. With seven days to go, I invite you to check out Cabrini Connections' Theory of Change, outlined in the Seven Success Steps shown on this page. Tutor/mentor programs from across Chicago will be sharing their strategies at the conference next week. For more details and to register, visit http://www.tutormentorconference.org/ or call 312-492-9614. Thank you. Wednesday night mentor Kate Pomper found out about Cabrini Connections through a friend at work and signed up in January 2009. She has been with her mentee, Ah'Queen James, since May and adores working with her. They got to know each other over the summer by meeting a few times off-site, first at The Art Institute of Chicago and later at a cafe to read To Kill a Mockingbird. Kate says it was very helpful to do some non-tutoring first in order for them to connect on a more personal level. Of Cabrini Connections, she says it is "amazing [and] all-around fantastic... Of all the tutor/mentor programs I've worked with, it's my favorite one." We're glad you like it here, Kate. Thanks for being a great mentor! You can read the rest of Kate's spotlight in our center at 800 W Huron. Alexis Montgomery is in her FIFTH year at Cabrini Connections. She and her brother, Darren Forest, joined us in September 2004 and their sister, Aiesha, who now attends Southern Illinois University, is an alumnus of the program. I guess Cabrini Connections runs in the family. Alexis is matched up with first year mentor Sandra Lee, a student at the University of Illinois at Chicago. "She's cool," says Alexis. "She keeps it fun... I want her to be my tutor for the rest of my life." We're glad to hear that you like Sandra, Alexis. Our vision is that every child who joins a tutor/mentor program in 7th or 8th grade is starting a job or career of his or her choice by age 25, so we will do our best to facilitate your continued relationship beyond this year. 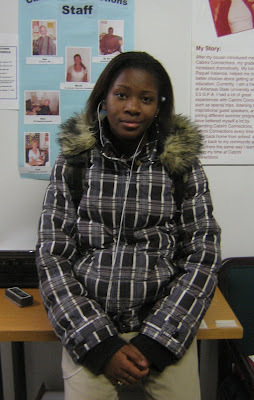 Alexis is a senior at Chicago International Charter School Northtown Academy. Her favorite subject is Western civilization. In her recent studies of Greek mythology, which has a tremendous influence on Western culture, Alexis was surprised to read that Oedipus, the son of the king and queen of Thebes, was abandoned on the side of a mountain because it was prophesied that he would kill his father and marry his mother. The prophecy did come true, but in any case, Alexis cannot imagine deserting a child. Outside of school, Alexis' favorite thing to do is dance. She also loves to play basketball and violin or viola. She is on the girl's basketball team at Northtown and she has been taking music lessons at Old Town School of Folk Music for more than six years. When she grows up she would like to be a professional basketball player or a photographer. In order to get into a career of her choice, Alexis plans to attend college next year. She has applied to Wright College, one of the City Colleges of Chicago, and is working on an application to Southern Illinois University. She wants to study technology and fulfill a personal goal of building her own computer. After basketball season, she might join Tech Club to begin her training. As for an artistic side, Alexis has been nurturing hers in Art Club for almost a year now. She recently completed a wire sculpture of break dancers which is now on display in the back of our center. We look forward to showcasing more of her work at Cabrini Connections Annual Art Festival in April. Until then Alexis simply offers her sense of humor. "I like to see people smile," she says. We certainly are, Alexis. Good luck with applying to college. You're going to love it! The 2009-2010 Youth Leadership Council held its first meeting on Wednesday, November 4th. To start off the meeting, expectations, rules, and roles were discussed. Council members will essentially function as junior staff on tutoring nights - enforcing rules, helping with announcements, and being aware upcoming events' details. Several returning members recounted the accomplishments of last year's council, including the production of videos for National Mentoring Month. It was acknowledged that they often worked behind-the-scenes and needed to do a better job this year of making their presence known. The bulk of the meeting consisted of a brainstorming session for new ideas. 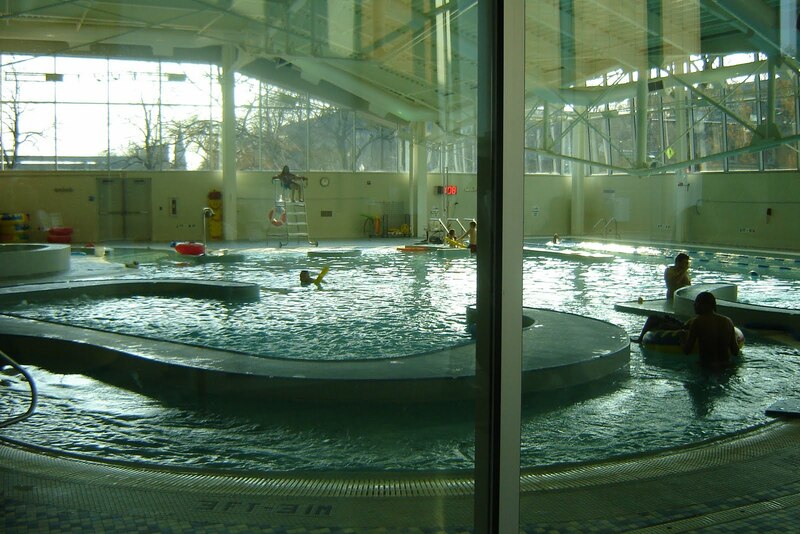 The council discussed center improvements and potential fundraisers to support them, such as a bike-a-thon, a candy sale, and a car wash (or bash). As for additions to Cabrini Connections' space, the council would like to pursue the arrangement of a lounge in the back of the center for more relaxed mentor-mentee time. This will involve reorganizing what's already there and collecting donated furniture. Stay tuned for more details as this project develops. The last part of our discussion had to do with activity in the center. Members insisted that students need to bring homework for each tutoring session. If they don't have homework, their tutors need to get creative: look up math problems on the Internet, go over courses for next semester, read a book, etc. Members recommend that games be kept locked up for the first half of tutoring sessions in order to facilitate more constructive work. I favor this recommendation and we are looking to enact it after Thanksgiving break. As you can see, the council is already having an effect on rules and regulations at Cabrini Connections. We as staff appreciate their direct input and look forward to hearing more from them as the year goes on. Thank you. NyShanell Freeman is a 7th grader at Newberry Academy. This is her first year with Cabrini Connections, but her second with mentor Jessica Bearden. (They met at Cabrini Green Tutoring Program.) 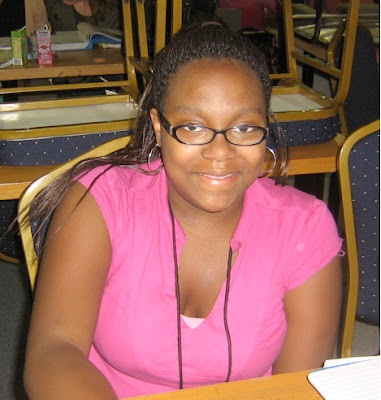 In school, NyShanell's favorite subjects are science and social studies because they are "easy" and "fun." That's a great combination! In a couple years, NyShanell will be entering high school, and she would like to attend one of the best schools in the city: Walter Payton, Lane Tech, or Whitney Young. Ultimately she wants to be a fashion designer when she grows up, so, in college, she imagines herself studying business and art. Indeed she has already begun to study art as a member of Cabrini Connections' Art Club, which is led by Jacqueline Shay and meets on Monday nights from 5:45-7:15. NyShanell likes Art Club because it gives her a chance to express herself. Art is her favorite hobby, but, unfortunately, it is not offered as a class or club at her school, so we're happy to fill the void. That's what our learning and enrichment activities are all about. You can keep up with the Art Club on their blog. Right now NyShanell is working on a wire sculpture of an octopus! Art Club is not the only club NyShanell is in. She is also in Tech Club. People always tell her she's good with computers and in Tech Club she gets to strengthen that talent. Recently she learned how to use Photoshop, an advanced editing software for photographs. Check out the Tech Club blog to see what else they've accomplished. NyShanell does her SVHATS every time she comes to tutoring and clubs, which has put her in the Top 5 on our leader board. We view SVHATS as a great behind-the-scenes communications tool and we are thankful to NyShanell for using it so frequently. She earns points with each entry, so down the line she will definitely be seeing some rewards for her commitment. She also earns points for being on time to tutoring and bringing homework, which she almost always does. Jessica helps explain to her how to do her homework and breaks it down so it isn't as difficult to understand. In one of NyShanell's most challenging subjects, math, Jessica uses real life examples to aid with comprehension. NyShanell has lived in Chicago all her life, but she would love to live in Los Angeles, New York, and/or Miami at some point. She has three little sisters, which means she has to be a role model and a mentor in her own household. Well, she certainly has a good example in Jessica and many of the other mentors at Cabrini Connections. Good luck with your studies, NyShanell. You're going to accomplish great things! Mentor Sarah Randag is in her third year at Cabrini Connections. She works with Ashaunti Roby, a 9th grader at Providence St. Mel School. Sarah heard about our program through a friend of hers, Wednesday night mentor Heather Coleman. Sarah volunteered for six years at Cabrini Green Tutoring Program while it was at the YMCA, but when they tore that building down and the program moved north, it no longer worked with her schedule. Cabrini Connections does, though, and we are glad to have her. Sarah is teaming up with the owner of Cellar Rat Wine Shop to host a wine-tasting fundraiser at the shop's location on Sunday, November 22nd, from 5:30-7:30pm. We are happy to see a volunteer take the initiative to raise much-needed funds for our program. Tickets are $25 for wine and appetizers. Owner Dean Schlabowske is donating the wine and use of his space, so 100 percent of your admission fee will go to Cabrini Connections. Dean will choose six wines for guests to try and the theme is (just in time for Thanksgiving): wines that pair well with turkey. Sarah is originally from Springfield, the capital of Illinois. She currently resides in the Ukrainian Village neighborhood of Chicago. She received her Bachelor of Science degree from Northwestern University's Medill School of Journalism and now works as a web producer for American Bar Association (ABA) Journal. She primarily works as an editor on the magazine's web site. After college and before working for the ABA Journal, Sarah worked at three newspapers; two of them in Florida (Key West and Naples). Last but not least, Sarah has some very simple tips for being a good mentor: pay attention, keep track, and follow up - very good advice from someone who's been doing this for almost 10 years. Thanks, Sarah! I am a recent graduate of Northwestern University and the current Assistant Program Coordinator at Cabrini Connections, Tutor/Mentor Connection in Chicago, Illinois.